Rockland, NY — In one of the most shocking moves to date about the 2019 measles outbreak, Rockland County officials have declared a state of emergency and has effectively banned any child under the age of 18, who has not received the MMR vaccine, from all public spaces. “Effective at the stroke of midnight, Wednesday, March 27, anyone who is under 18 years of age and unvaccinated against the measles will be barred from public places until this declaration expires in 30 days or until they receive the MMR vaccination,” according to a statement from Rockland County officials. The public spaces include schools, stores, places of worship and public transit, according to officials—essentially everything. Exactly how authorities will know if a child is unvaccinated is unclear. However, they are still planning to take legal action against parents. “Local police will not be asking for documentation of vaccinations, but will enforce it retroactively if a parent is found to have allowed their unvaccinated kids into the public spaces,” according to the county. What’s more, most people who get the measles make a full recovery within a week or so. Although some studies do link unvaccinated people to measles cases, according to multiple other studies, the MMR vaccine is likely worse than getting measles. By the pro-forced vaccination crowd’s logic, we should simply sacrifice hundreds of children a year to achieve an unproven theory of herd immunity. That is, of course, until it’s their child who is left permanently disabled by the vaccine. On a daily basis, we are seeing media outlets dehumanizing, degrading, and even calling for the silencing of those who are pro-vaccine safety or choose religious exemptions. 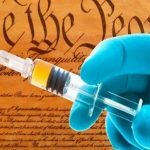 Using this fake epidemic as an impetus for pushing legislation, 100 bills have been filed in 30 different states proposing to expand, restrict or eliminate vaccine informed consent rights. And now, as the above declaration illustrates, legislation is no longer necessary and children can be sentenced to prison in their homes for the sole act of being unvaccinated.